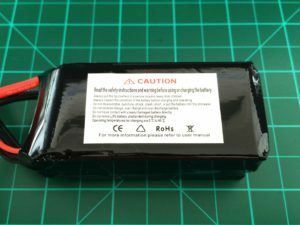 UK distributor and RC manufacturer RadioC has its newest Drone Lab lipo packs out on the market. 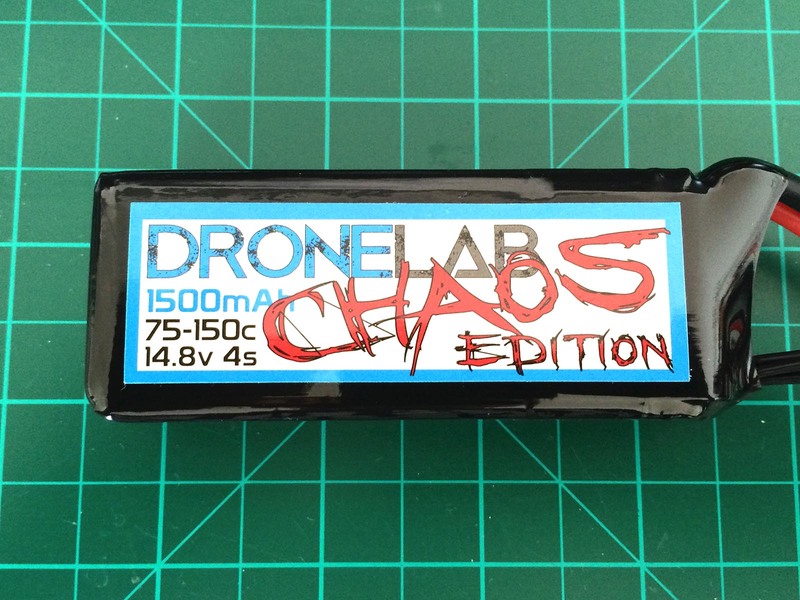 The Drone Lab series is specifically designed for use in race quads. 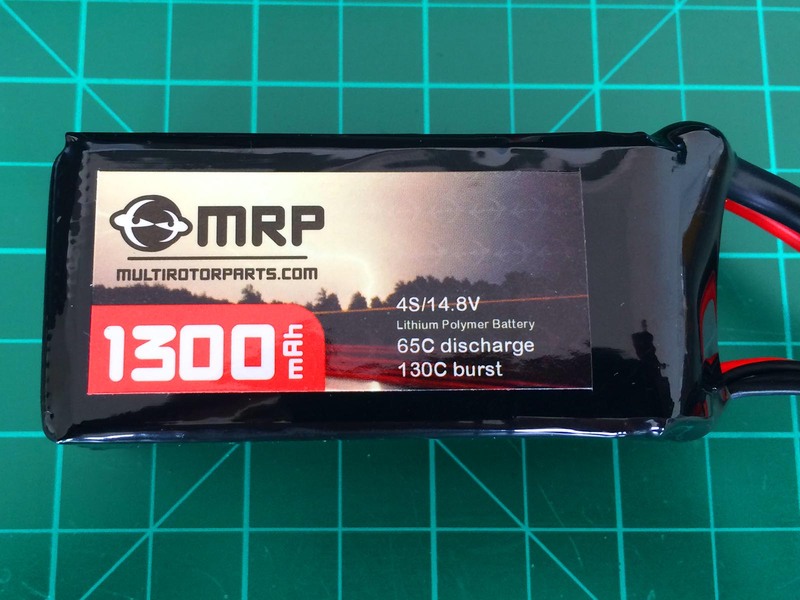 This review looks at the 1300 mAh version of the 4 cell pack. 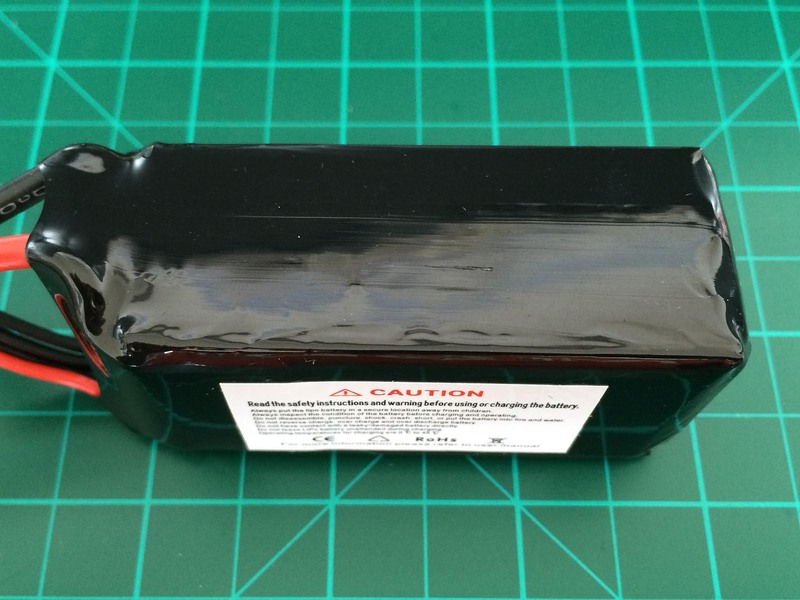 Some competitors almost started a contest on the „most beautiful“ lipo. Well RadioC is taking the other route, aware of the fact not to win any design prices. 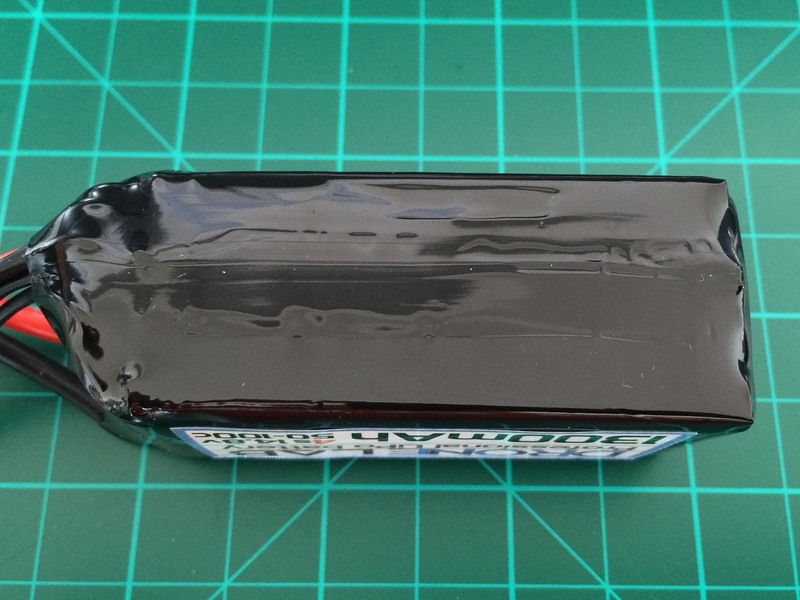 That said: The Drone Lab packs come in a simple black shrink wrap. A blue-ish sticker on the front – that’s it. As a purist I kind of like that approach. 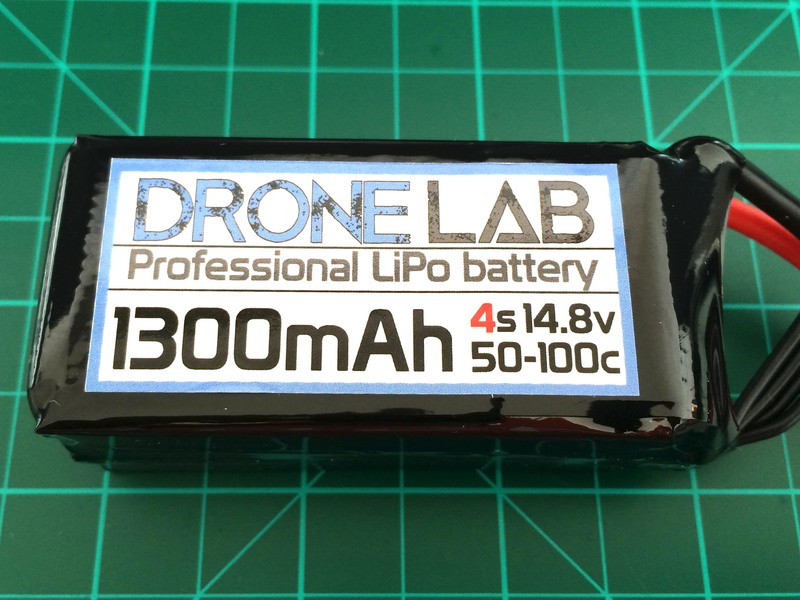 The Drone Lab 50-100C pack is a standard 4S1P config flight pack for high power use. A foam layer on the front and back provides extra impact protection on the cell edges. Plugs: The Drone Lab pack comes with standard XT60 connectors* equipped. Cables: RadioC uses 14 AWG wires on this packs. The high flexible silicon layer is rated up to 200°C. Cable length is about 9 centimeters. CV-Phase is really short on this cell type. Balancing in normal mode took only 1:00 min. Cell drift during charge was unobtrusive. This is for 1C charge (1,3 A). During this test the pack delivered 901 mAh. This is 69,3 % of nominal capacity. A solid value. The average cell voltage stability on the DroneLab pack can be considered good. Cells dropped below 3,5 V benchmark during the first three current pulses, though. Interpretation: The internal resistance of 3.32 mΩ average per cell indicates a „true“ C-rating of around 37 C (48.5 A). This is on the conservative side and represents a current draw that will make the pack last for a long time. The pack had no problems delivering during high C discharge pulses. The Ohm-matching is a little off on this cell. Cell #4 is significantly performing better than the rest of the cells. 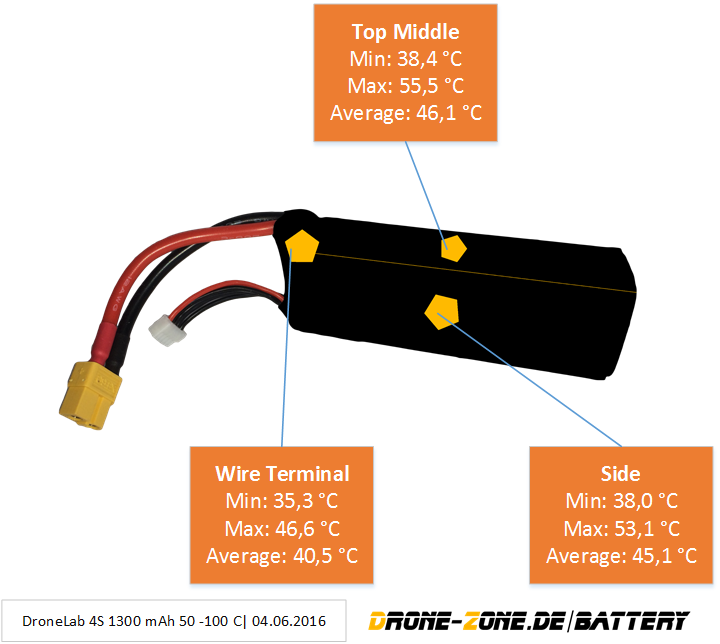 Cell drift is low on this DroneLab battery. Even to the end of the discharge cycle the cells stick relatively closely together. All temperature probes reported values below cut-off point at 58°C. Max. temp during discharge was around 56,6 °C on side of pack. 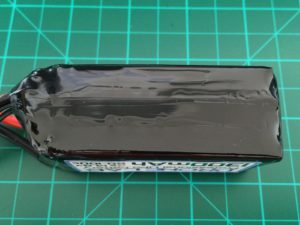 Note that heating of stressed LiPo packs will continue for some more time even when load is cut. Cut-Off /warning value for this battery should be chosen 3,5 V minimum. After this point voltage drops very quickly. The battery provided 901 mAh (69,3 %) during the 25 C discharge. During the test of pattern 1 the pack delivered 895 mAh. This is 68,8 % of nominal capacity. Still a good value. In patter 2 testing 917 mAh (70,5 %) could be used before first cell reached cut-off voltage. 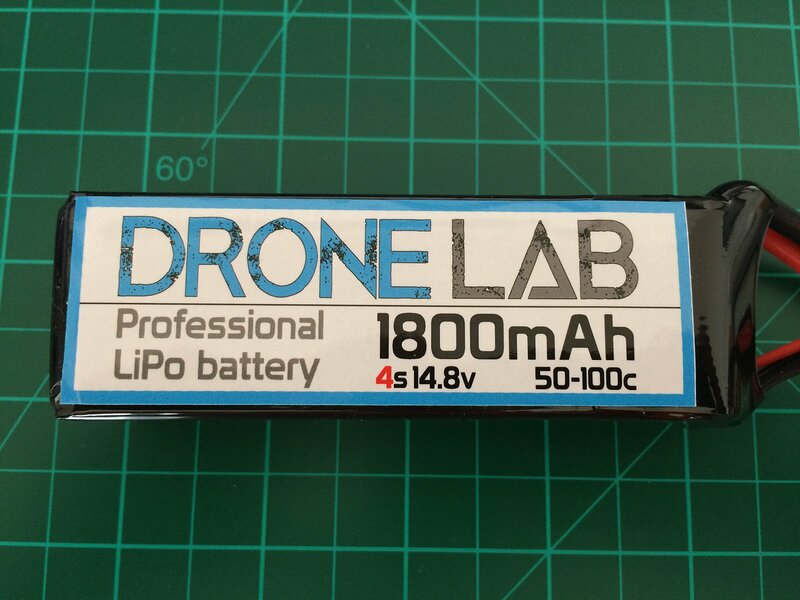 The DroneLab 4S 1300 mAh 50-100 C battery is a usual sized pack with a decent capacity to weight ratio of 8.96 mAh/g. The measurements are standard for the 1300 mAh class. Overall build quality is good. The design is best described as modest. Perfect for everybody looking to put a black pack on there full carbon style mini quad! Average voltage stability is very good on this pack. Nevertheless, one should be aware of the relatively strong voltage drop to the end. Once cell voltage goes below 3,5 V its time to come in for landing quiet fast. Usable cell capacity under real-life flight setting is a little below average, but alright. Ohm-matching is a little off on this test pack, one cell is considerable stronger than the rest. As most of the packs in this performance class the C rating is a little over the top. 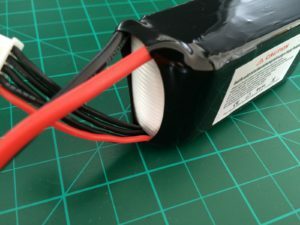 If long term continuous currents are needed, make sure to stay within the real rating of around 37 C. Nevertheless, the pack is able to handle short currents spikes way above this (up to 45 C) without any problems. I would recommend to use this packs for continuous loads up to 45 A maximum. Notice that under this circumstances heat generation of the pack will be strong (assure proper cooling!). Also the 1300 mAh battery tends to get a little bigger to the end of a high load discharge cycle. This swelling will reverse within a few minutes, so nothing to worry about. 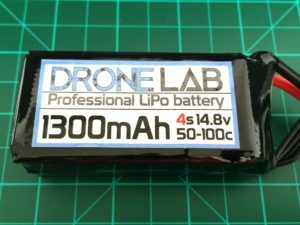 Pricing of the DroneLab 4S 1300 mAh 50-100 C battery is hot. For around 19 € this pack is highly competitively priced and almost 10 Euros cheaper than some of its competitors products. The great price might even let some buyers overlook the rather early performance decrease to the end of the discharge cycle. Quality wise the DroneLab makes a good stand for it’s really low price tag.